Duluth, officially designated a dynasty, jumped the Minutemen in the game’s opening two minutes. Swarming the UMass defenders, the Bulldogs generated a half-dozen shots, three grade-A chances, and a drawn penalty. In the final analysis, UMass never recovered. Duluth captain Parker MacKay roofed a backhand on the ensuing power play, and the champs had the only goal they needed. “I don’t know if nervous is the right word, but we were out of sorts,” said UMass coach Carvel about the opening sequence. Duluth outworked and outmuscled UMass to such an extreme degree, that the Minutemen managed a mere seven shots at the game’s halfway point, 18 for the game. The UMass power play, so dominant throughout the season, went 0 for 4 with just 3 shots attempted in the championship game. But analytics didn’t tell this story of dominance—seeing was believing. College hockey media maven Bernie Corbett called Duluth, “Seal Team Six, the guys that took out Bin Laden.” He witnessed them do the same thing in last year’s Frozen Four as well, strangling the life out of Ohio State and Notre Dame. Buffalo 2019 was the program’s third championship of the decade. Playing Duluth and its anaconda style, a two-goal deficit is a mountain, three is Everest. This championship game was also a bittersweet farewell to Cale Makar, a player the college hockey universe won’t soon forget. Experts are convinced that Makar will be playing in the NHL’s Stanley Cup playoffs Monday, but his heart was clearly with his college mates after this farewell game. He came to the podium still wearing the UMass colors, adorned in a sweaty sweater. This was not a heartbroken UMass team on the podium; they had been defeated so thoroughly that they could actually pause and consider what they HAD accomplished without suffering the pain of what could have been. 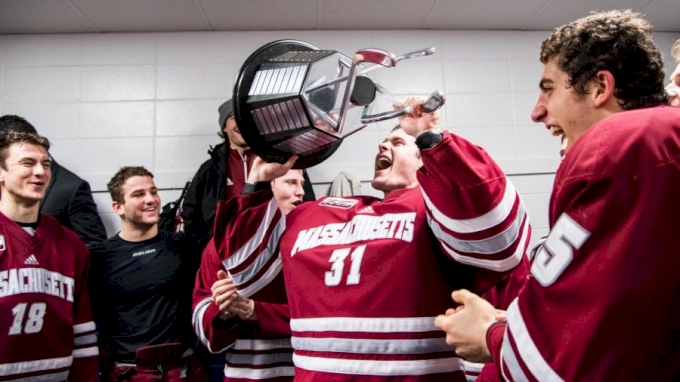 There’s was a season of unimaginable accomplishments for a squad picked to finish in the middle of the Hockey East pack: it’s first #1 national ranking; it’s first Hockey East regular season title; it’s first Frozen Four. Heady stuff for a team that had only managed five wins two seasons ago.